Written in PHP7, Phở Kernel is a programmable interface, as well as a configuration, events broker for distributed micro social graphs. Phở Kernel is not static, which means you can run multiple kernel instances in a thread, and you can halt and reboot each thread as many times as needed. Firstly, we form the kernel object by passing a configuration variable that holds all our preferences and server-related settings. Secondly, we boot it up. Optionally you can pass the founder object as a parameter, which would initialize the kernel (for a single time) with that user as the founder. This may be useful if you have a custom Actor node. Finally, we start playing with it by calling graph() and founder() methods. Phở Kernel allows you to launch and manage social graphs. Just like any other graph, social graphs are also formed by "nodes" and their relationships identified by "edges". Each of these types have their own particular characteristics which we will discuss in the chapters 5, 6 and 7. Both edges and nodes are "entities" and they're represented in the database with a cryptographically secure unique identifier in the form of: "4a406464850849e9b13ac38d0a67c157". For more information on Pho IDs, check out section 9. 5 characters (aka Actor): Neo, Morpheus, Trinity, Agent Smith and Spoon Boy. 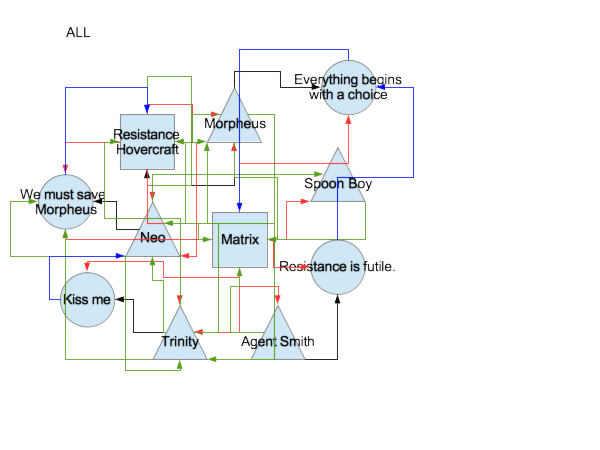 2 graphs: Matrix (the network itself) and a group called Resistance Hovercraft, created by Morpheus. and "Kiss me" a private message by Trinity transmitted to Neo before she dies. The examples above should give you an idea about how Actor, Graph and Object nodes behave. The list of all the configuration variables you can play with can be found in pho-microkernel's defaults.php file. // The adapter to use, and uri the service options. // "actor" => ... // not set here. Storage To store and retrieve plaintext or binary files such as photos, videos, zip files etc. Filesystem OpenStack Swift AWS S3 ..
To illustrate, you can access database with; $kernel->database(), and logger with; $kernel->logger(). If this is not the first time the kernel is booted up, the argument will be ignored. $space = $kernel->space(); // returns the outer graph. $graph = $kernel->graph(); // returns the actual graph that all your nodes will become part of. The outer graph, or "space" is a super-graph that has one and only one element, that is the graph. To query a node, you just use the kernel's gs() method, which is similar to UNIX' filesystem. You must know the ID of the node. You call a service with $kernel->$service_name where $service_name represents the service keyword in lower case. For more details, see Chapter 4. Object and Graph nodes may be created with at least three constructor arguments; $kernel, $context and $creator (which is an Actor object, the creator of this object). However, please note, graphs and object nodes shall not be created manually. The recommended way to create such nodes is via formative edges, which we will see later. 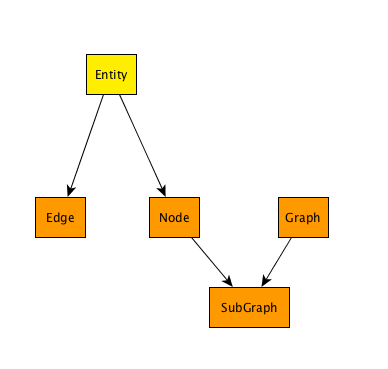 Graph contains objects that implement NodeInterface interface, such as Node and Subgraph, but not Edge. Graphs contain other nodes. This is their one and only function. A social network itself is a Graph. We call it the "Network". Another typical type of Graph that most social networks have is Groups. In social network context, social network members are the Actors. To illustrate this, take the example of Facebook. Facebook itself is a Graph. The groups and friend lists on Facebook are also Graphs (micro graphs). And you, as a Facebook member or the pages you own are Actors, because they like (subscribe) and respond (write) objects. Objects are what social networks are centered around. They are the fundamental units of sharing. A photo or status update can be examples of object. The only edge that originates from Objects is Edge, which does the exact opposite of Subscribe, e.g. sending Notifications. An Edge (aka lines or arcs in graph theory) are used to represent the relationships between Nodes of a Graph. Therefore it is a fundamental unit graphs. Pho IDs are immutable and come in the format of cryptographically secure, similarly to UUIDv4, though not the same. Pho IDs are used to define all graph entities, e.g nodes and edges. It is 16 bytes (128 bits) long similar to UUID, but the first 8 bits are reserved to determine entity type, while the UUID variants are omitted. Hence, Pho ID provides 15 bytes and 8 bits of randomness. Even at scale of billions of nodes and edges, the chances of collision is identical to zero. You can generate a new ID with $id_object = ID::generate($entity), where $entity is any Pho entity, and fetch its string representation with PHP type-casting; (string) $id_object. Notifications are the messages passed between notifiers and objects, or subscribers and their subscriptions. Notifications constitute a basic component of all social-enabled apps. to see how notifications works. One of the best features of the Pho Kernel is that it is event-driven. Anytime a new node or edge is created, deleted, edited, a signal is emitted. If set, a listener object (a Callable) can process the signal in real-time. node.added: when a new node is added to the graph. modified: when the graph is modified with a node addition or removal. modified: when the edge is modified either by connecting or by its attribute bag. deleting: when the edge is being deleted. modified: when the subgraph is modified by its attribute bag. edge.created: when there is a new edge originating from this subgraph. edge.connected: when the orphan edge of this subgraph is connected to a head. deleting: when the subgraph is being deleted. modified: when the node is modified by its attribute bag. edge.created: when there is a new edge originating from this node. edge.connected: when the orphan edge of this node is connected to a head. deleting: when the node is being deleted. edge.registered: (string $direction, string $class): called by particles when registering edges. This function may be used extra edges easily and independently, without extending the constructor itself. notification.received: (AbstractNotification $notification): called when the actor received a notification. graphsystem.touched: when an entity has been persisted to disk. graphsystem.node_deleted: when a node is removed from persistent state. graphsystem.edge_deleted: when an edge is removed from persistent state. Hooks allow developers to intercept certain functions that may benefit from hydration at higher-levels. Hydration takes place with persistent objects which, once deserialized, may lose some of their object associations. To illustrate, when you persist a node object, its EdgeList object may turn into an array rather than a full-blown object, which would be hard and expensive to store. Then, in order to retrieve the edge list, you can use the IDs and tap into your database in separate calls, which would enhance the performance of your app. Lib-Graph's hooks come into play in such scenarios, because you can intercept these getter methods and inject value by leveraging the information stored in your database. The first argument is the hook key, in string format. The second argument is a PHP closure (you can pass it as a variable too). Below you can see a full list of entities that support hooks and their keys. get(ID $node_id): called when get(ID $node_id) can't find the object in $nodes. Enables you to access $node_ids to fetch the object from external sources. The return value is NodeInterface. members: called when members() can't find any objects in $nodes. Enables you to access $node_ids to fetch the objects from external sources. The return value is array (of NodeInterface objects). head: called when head() can't find the head node. Enables you to access $head_id to fetch it from external sources. The return value is NodeInterface. tail: called when tail() can't find the tail node. Enables you to access $tail_id to fetch it from external sources. The return value is NodeInterface. predicate: called when predicate() can't find the predicate object. Enables you to access $predicate_label to recreate it or fetch from external sources. The return value is PredicateInterface. context: called when context() can't find the context. Enables you to access $context_id to fetch it from external sources. The return value is GraphInterface. creator(): called when creator() can't find the creator. Enables you to access $creator_id to fetch it from external sources. This can be used with any particle; be it an Actor, Object or Graph. The return value is Actor. edge(): called when edge() (in NotificationList.php) can't find the edge. Enables you to access $edge_id to fetch it from external sources. The return value is \Pho\Lib\Graph\EdgeInterface. Get: to retrieve an edge. Default implementation. Set: to create an edge. Default implementation. Form: not only to create an edge, but also its head node. Default implementation. Has: to check if such an edge does exist. Default implementation. Objects that implement the InjectableInterface and use the InjectableTrait are easily extensible, with a plug-in variable architecture. The use Injectable is discouraged, as it may represent security holes if not used properly. But you can use it when you must. Currently the only class that implements it by default is AbstractEdge. Acl stands for "access-control-lists". Pho handles access to nodes and graphs similarly to how UNIX handles access to files and folders, hence the name. a node is the UNIX equivalent of a file. a graph is the UNIX equivalent of a directory. read remains the same for both. write reamins the same for both. UNIX' execute is Pho's subscribe. In addition, Pho introduces the "manage" privilege. Due to this additional privilege (e.g. "manage"), Pho uses a hexadecimal system to manage privileges, in contrast to UNIX' octal. UNIX' u (users) remain the same. The u group is the owner of the object (or the actor itself, if it's an actor). s (subscriber) is a new privilege group. It consists of all the subscribers of this node. The subscribers include the head nodes of any edge that extends the Subscribe edge. g (graph) is same as UNIX' g (group). It is the group of actors that belong to the same context with the "u" of this node. o (others) is same as UNIX' o. It is "others", meaning actors that belong to graphs not included by the context that the "u" belongs to. Additionally, one can set up fine-grained privileges per actor and graph, using Pho's advanced access control lists, which is again, inspired by UNIX' access control lists, but slightly different. Again, similarly to UNIX, Pho also has "sticky-bit" which ensures the privileges of an entity (or object) can only be changed by its owner, and not by the admins. 0x: is PHP's hexadecimal declaration. So it must be there. 1: is the sticky bit. Similar to UNIX, it may be 0 or 1.
e: is the "u". This gives the u "manage" privilege, in addition to "read", "write" and "subscribe". So it's 1(subscribe) + 2(write) + 4(read) + 8(manage) = 15("e" in hexadecimal). 7: is the "s". Subscribers can write to, read and subscribe to this node, but not manage it. 4: is the "g". People in the same graph with this node. 1: is the "o" -- outsiders. Only the group owner can edit or assign new privileges. The group managers can do anything, except, see above. The members (subscribers) of this group can post (write) and read anything. The people who are part of this network can read and subscribe the contents of this group, which means it's a read-only public one. The outsiders can only see the description of ../. Pho is designed in microservices architecture. This is a directory of Pho stack projects; it starts with foundational packages and goes up to the user-level. pho-lib-graph General purpose graph library. pho-framework A stateless framework that establishes the core principles of the Pho stack. pho-microkernel Augments the framework with services and ACL (access-control-lists), rendering it stateful. pho-cli Command-line interface to help compile graphql files and initialize projects. pho-server-rest REST APIs that can interface with any programming language or via HTTP. pho-lib-graphql-parser General purpose GraphQL schema parser. Used by pho-compiler. pho-compiler Compiles the GraphQL files into PHP interpretables. Used by pho-cli. Here is the steps to compile a recipe. The Web recipe (https://github.com/pho-recipes/Web) will be used which is also the recipe used for GraphJS. This contains source files that will be used to generate PHP files. Clone the repo: https://github.com/phonetworks/pho-cli and install composer dependencies. This contains CLI to generate files from recipe using remote compiler. The first argument is the source directory containing graphql schema. The second argument is the destination directory where the generated files are placed. Note: The repo of each pho-recipes contains .compiled directory which consists the latest compiled code.